Accuracy is key! Accuracy saves you money! S. W. Betz Company is a certified service agency with the Maryland Department of Agriculture, Weights and Measures Section. Each technician is trained and certified for scale inspections, calibrations, testing, repair and other weighing equipment services. Our test weights are calibrated and certified by the State of Maryland. We have generally found that scale calibration should be verified when scales are initially received, even when purchased as factory-calibrated. Many states require that scales used to buy and sell based on weight must be NTEP approved, inspected and certified to be accurate. How often your scales need calibration is dependent on several factors including the frequency of use, external operating conditions and the acceptable margin of error for your specific industry. Our technicians and staff are available to assist you in determining an appropriate calibration interval, after which, your company will be contacted to schedule calibration. Portion Control Scales – Light capacity scales used in bakeries, cafeterias, restaurants and all food processing plants, these scales can also be used for many non-related food applications as well. They have the ability to weigh in pounds, kilograms and ounces and often include a tare feature. Physician Scales – These scales are found in hospital and medical offices, nursing homes, health clubs and schools. Bench Scales – From checkweighing scales to shipping scales, bench scales are versatile and excellent for food process weighing applications, ready to eat applications and pharmaceutical and chemical applications. Platform Scales – Whether working as part of a conveyor system or independently, platform scales are most often used for industrial weighing, commercial laundry applications, airline cargo systems and recycling programs. 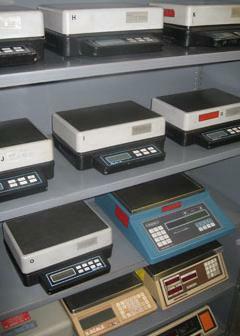 Price Computing/Deli – There are a variety of scales used in deli, food and retail stores, with optional label printers. Jewelry Scales – Extremely precise weighing very small amounts, these scales are available in many different capacities. From pocket scales to table tops, most are portable and easy to use. Counting Scales – Used in manufacturing plants, pharmaceutical, distribution and food processing and by vending companies, these scales count individual products that are packaged, shipped or inventoried. Floor Scales – Floor scales are ideal for pallet weighing, drum weighing and warehouse shipping and receiving. If you are in need of or would like more information on any of our weighing products and scales, please contact us and one of our team members will be happy to assist you.